The members of Cheap Trick have reigned as the high priests of hard-rocking U.S. power pop for more than 40 years, with an influential and infectiously ever-youthful sound driven by the impeccable playing of bassist and co-founder Tom Petersson. Now, on the heels of Cheap Trick’s April 2016 induction into the Rock and Roll Hall of Fame, Gretsch is proud to introduce the G6136B-TP-AWT Tom Petersson Signature 4-String Bass. 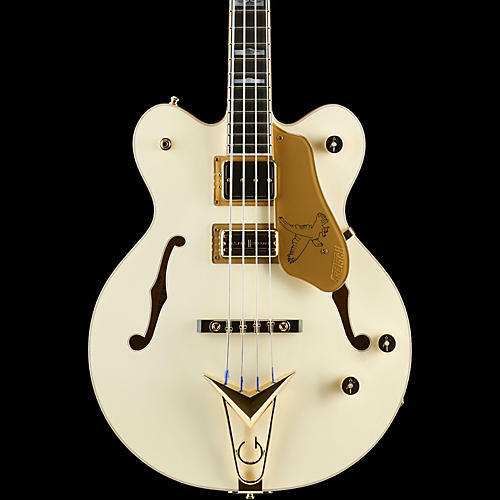 Stunning in style and tone, it puts Petersson’s distinctive stamp on the classic White Falcon Bass design, with premium features including a Gretsch Rumble'Tron neck pickup and custom Seymour Duncan Super’Tron middle pickup, short scale length (30.3”), Adjusto-Matic bridge and Gretsch “Cadillac” tailpiece, gloss-finish maple neck with “U” profile, 12”-radius ebony fingerboard with 22 medium jumbo frets and mother-of pearl inlays, gold hardware and pickguard, and more. Deluxe hardshell case included.